Help us meet other remarkable women, from your teams and communities! For the next 5 registrations at I T.A.K.E Unconference this week, we offer an invitation for a lady colleague to join! You will receive the discount code after registering. 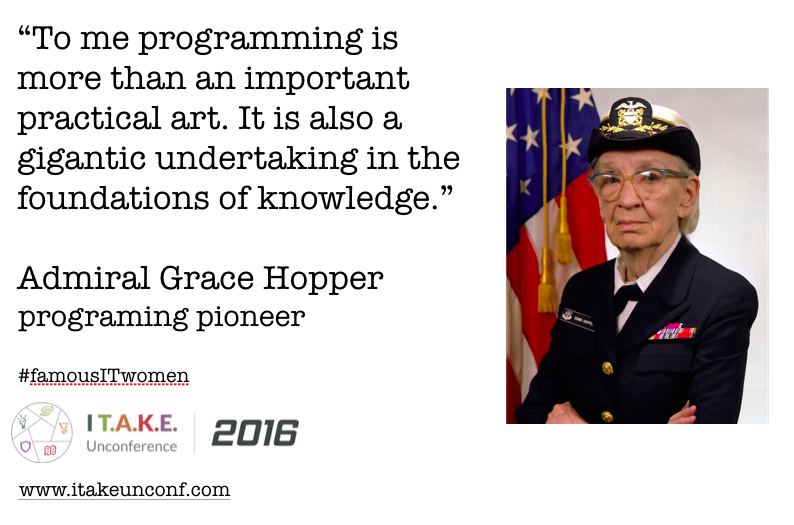 After finding the professional journey of Franziska Sauerwein, software craftswoman speaking at I T.A.K.E Unconference, we invite to find more about United States Navy Admiral Grace Hopper (1906-1992). Often defined as a woman ahead of her time, she is one of the first programmers in the history. With a PhD degree in mathematics, she was part of WAVES (Women Accepted for Volunteer Emergency Service, U.S. Naval Reserve), and later joined the programming team at the new Mark I computer, at Harvard University. One famous anecdote kept perpetuating until today about her time in the Mark I team. One day a computer failure had Hopper and her team baffled. They opened the machine and they discovered the source of the problem: a live moth was stuck in one of the electrical switches controlling a circuit. Hopper taped the offending creature into her log book and noted beside it, “first actual bug found.” She is credited with the terms “bug” and “debug” for computer errors and how to fix them. 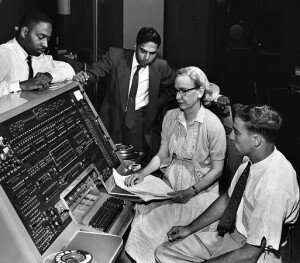 Grace Hopper is also the creator of the A compiler, a program developed during her time at UNIVAC I (UNIVersal Automatic Computer I – UNIVAC I (UNIVersal Automatic Computer I). After joining the consortium Conference on Data Systems Languages (CODASYL), as technical consultant on the committee, she created a validation software for COBOL to make sure the language could perform its function. COBOL, which stands for “COmmon Business-Oriented Language”, is still used in order-processing business software today. The most important thing I’ve accomplished, other than building the compiler, is training young people. They come to me, you know, and say, ‘Do you think we can do this?’ I say, ‘Try it.’ And I back ’em up. They need that. I keep track of them as they get older and I stir ’em up at intervals so they don’t forget to take chances. Stay tuned & follow #famousITwomen! During the next days, we will share more stories about women who made & make history in IT. If you want to meet remarkable software craftswomen, join us at I T.A.K.E Unconference 2016! Help us meet other remarkable women, from your teams and communities! For the next 5 registrations at I T.A.K.E Unconference this week, we offer an invitation for a lady colleague to join!